Visit the Tate Student Center for more information on more than 300 student organizations. UGA registers more than 800 student organizations annually. 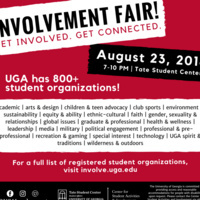 For a full list of registered student organizations, visit https://involve.uga.edu.